You may have heard of Redverz Tents, but what do you know about Kevin Muggleton? The man behind the brand is just as unique and compelling as his products; a true life-bred motorcyclist. Learning his story gives us perspective on the products he designs and the passion that he carries for them. Kevin started as a photographer and videographer for National Geographic. By necessity, he had to use two wheels to traverse many of the on-location shoots in remote destinations. National Geographic would supply Kevin with all of the supplies needed to ride, camp, and complete the various shoots. Over the ten years he spent living out of tents, Kevin began to see some shortfalls in the equipment he had available to him. This all culminated in a trip to Mali, Africa, where he was forced to leave the bulk of his motorcycle gear outside of his tent one night. In the morning, he awoke to find that everything was gone, stolen while he slept. This experience, and the frustration that followed as Kevin tried to reclaim or replace his lost items while on the road in Mali, was the impetus that started the first Redverz Motorcycle Tent. 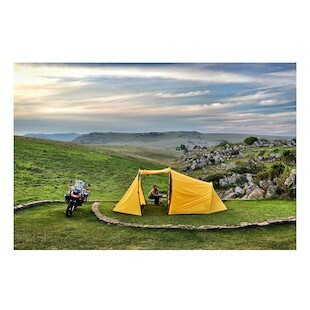 The main goal was to design a tent specifically for bike travel so that all a motorcyclist's gear could fit inside along with his or her bike. This is a tall order, especially considering the large ADV bikes that this product is marketed to, as well as the fact that Kevin was designing in part for his own 6'4" tall frame. 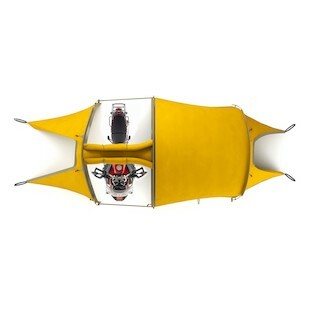 Nevertheless, he succeeded and followed up his first creation with an improved Redverz Series II Expedition Tent. The Redverz Series 2 Tent incorporates almost 50 changes from the original, including better poles, better fabric, more high-wind resistance and more interior space. All this was accomplished without increasing the overall weight, which comes in right at 13 lbs. When packed down, it will take up just a 21"x9"x9" footprint -- easily stored atop luggage, or across a rear rack. Kevin demonstrates the easy Redverz Tent Setup in a short video. With practice, this can easily be done in less than five minutes, and he stresses that it is designed to be easy to assemble even in adverse weather conditions. Thats not all that you'll find from Redverz Gear! Knowing the inherent pitfalls of constant use and wear, Kevin also produces a Redverz Series II Ground Cloth to protect the tent floor. 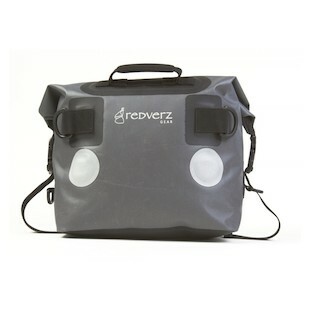 You can also purchase an awning kit for extended shade and dry bag made by Redverz. 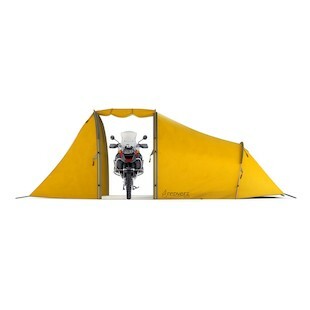 It is a rare occurrence to see such extensive experience come with a product like the Redverz Tent. Often times, testing and development only come after an item hits the market. In this case, we get to benefit from the life and two-wheel pursuits of Kevin Muggleton as they've applied in his meticulous design and engineering of these products. Redverz Tents and Gear put you out in the wild, where durability and longevity count the most. You can trust that Kevin has very literally "been there, done that."